Add our store to your favorites and receive exclusive emails about new items and special promotions! Dell PowerEdge R900 Server 4x 2.93GHz X7350 4-CORE 128GB 10TB PERC 6i 2PSU. 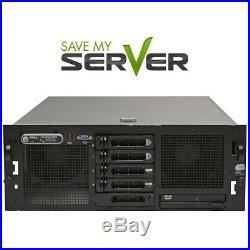 At SaveMyServer we put our heart into our business and stand behind our products. We want you to be satisfied. 4 x Intel Quad Core 2.93GHz 8MB 1066MHz X7350. 32 x 4GB Memory Sticks; Up to 256GB (32 DIMM Slots Available). 5 X 2TB 7.2K SATA 3.5 Hard Drives. Five SAS/SATA 3.5 Bays. 7x PCIe Onboard Slots - Four x8, Three x4. Redundant 1570W Hot Plug Power Supplies - Power Cords Not Included. 1 x 5 SAS/ SATA 3.5 Bays. YR352 Quad Port GB NIC. Embedded ATI ES1000 with 32MB SDRAM. Dell Perc 6i Hardware RAID with Battery Backup. Front Bezel Not Included - Message for Availability. Rapid Rails Not Included - Message for Availability. Windows 2008 Server R2 Evaluation Edition Only (installed for our testing purposes). At SaveMyServer we stand behind our refurbished servers. For our testing process we follow the same routine that we use to load our production servers. Build an array (if applicable). Update the drivers and firmware. Install the operating system and run diagnostics. Whatever we cant use, we recycle. SaveMyServer Item Information: 10EE - Eric - 11363 qid: 5673. The item "Dell PowerEdge R900 Server 4x 2.93GHz X7350 4-CORE 128GB 10TB PERC 6i 2PSU" is in sale since Wednesday, May 11, 2016. This item is in the category "Computers/Tablets & Networking\Enterprise Networking, Servers\Servers, Clients & Terminals\Computer Servers".